A direct-drive spindle motor and linear guideways on a milling centre enable high-speed metal cutting, but that configuration does not lend itself to the efficient machining of highly alloyed nickels like Inconel, or Duplex and Super Duplex stainless steels. For these materials, a gearbox drive and box ways are more appropriate, but they are difficult to find on smaller, C-frame, vertical machining centres. However, LB Bentley, based at the Kingfisher Business Park in Stroud, part of the Severn Glocon Group, has identified a suitable platform for producing its subsea valves, and also its filter and dryer equipment, from tough materials: the AA1165 VMC with 1100 x 650 x 600 mm working envelope built by Toyoda joint co-operation company Wele. One such machine was installed at the start of January 2019 and a second is due for delivery shortly. The sales and service agent in the UK and Ireland for the Taiwanese machine manufacturer is Whitehouse Machine Tools. Although LB Bentley’s existing production equipment has served it well, the company wanted initially to replace two VMCs with new machines capable of meeting the tight positional tolerances and surface finish required when producing components from a range of difficult materials, including 625, 718, 725, 825 and 925 nickel alloys and Duplex/Super Duplex stainless steels. 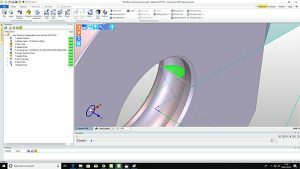 One of the difficulties with the ageing VMCs was the inability to mill by circular interpolation a sealing surface without four quadrants being visible and lines apparent at each change of axis direction, with the attendant risk of parts being rejected. Quality is paramount, with ±1.5 µm dimensional accuracy and 0.4 mm Ra surface finish required. The AA1165 machine, fitted with a high-pressure (70 bar) coolant system, has proved itself easily capable of achieving the drawing tolerances when machining nickel and steel alloys. Features of the Wele that secure a combination of heavy cutting performance and precision finishing include: two-speed, auto-change gearbox drive to the 18.5/15 kW BIG Plus 8000 rpm spindle, which delivers up to 469 Nm of torque; hand-scraped square-section guideways; rigid construction; up to 10 m/min cutting feed rate; and 36 m/min rapids in X and Y, and 20 m/min in Z. The machine’s Fanuc 0i-MF CNC is already prepared for controlling a fourth axis, which is an optional extra offered by Whitehouse on the AA1165, whose 1300 x 650 mm table has plenty of room at one end to accommodate it. LB Bentley’s operations manager Andrew Kethro says: “We have been extremely pleased with the performance of our new machine. It is very rigid and the load monitor highlights that the machine can easily cope with the materials and depths of cut specified. So these machines should be well set to take us into the future, regardless of what the industry throws our way. Our machinists have commented on how quiet the machine is when cutting at high torques and low speeds, 1500 rpm being a maximum here when milling our difficult alloys. Harnden explains that Whitehouse carried out the cutting trial on LB Bentley’s material using the program and tooling from Stroud for the designated part, which initially needs rigorous fly cutting across the top of the billet. He witnessed the demonstration at the supplier’s technical centre in Kenilworth and noted the quietness of the process due to the machine’s rigidity and low levels of vibration. The latter attribute contributed also to the required accuracy of machining and surface finish being achieved. A further point in Wele’s favour was the low spindle load when cutting the part. Operators in the Stroud factory extensively monitor the load meter on all machining centres so that they can see when it rises, indicating that a tool is wearing and starting to compromise accuracy. 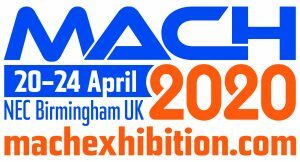 Harnden adds: “When it arrives and the two mills they are replacing have gone, there will only be Fanuc CNCs on the shop floor, making it easier for operators to move between VMCs and giving us a greater degree of flexibility to allocate jobs to the available resource. 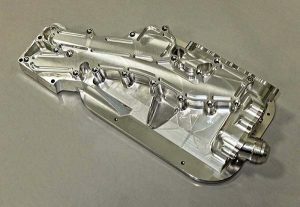 A company specialising in industrial rubber injection moulds and cold runner blocks for the automotive sector uses WorkNC CAM software to create 3+2 axis tool-path programs across a range of eight CNC machine tools, and WorkPLAN ERP software to consolidate various data sets from sales orders to invoices. Dixence is an SME operating with around 30 staff out of a 1500 sq m workshop and 500 sq m engineering department in Erbray, France. 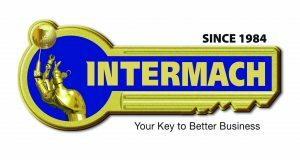 The company’s main business is designing and manufacturing tooling equipment, and manufacturing moulds for all-rubber bonded inserts, as well as plastic, metal and rubber parts. Managing director Gérard Beloeil says these can be injection, compression, regulated-transfer or cold-plate moulds produced in different grades of steel; pre-treated, hardened, and with a special coating. “The finished parts are used to support gearboxes, engines, exhaust pipes, suspension systems, engine sealings and soundproofing,” he says. Working for major suppliers of rubber parts around the world, including France, Germany, Spain, USA, UK, Russia, Turkey and Portugal, around 80% of output is for automotive contracts, with the rest going to customers in the energy, cosmetics and railway industries. The company has recently made a REP V710 L 50 rubber injection press available for validating moulds produced for the international market. 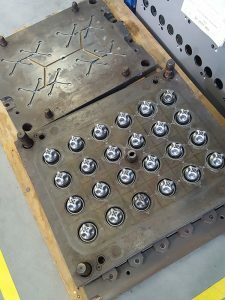 At the request of customers, moulds are tested directly on-site at Dixence, avoiding any costly part returns. WorkNC programs three Huron and two Mazak vertical milling centres, and two Mazak horizontal palletised milling centres to produce the moulds and blocks, along with one HSM milling centre for machining electrodes. is generated, containing full details of the mould, which will be used by the purchasing department and shop floor, allowing work to start on tooling elements. 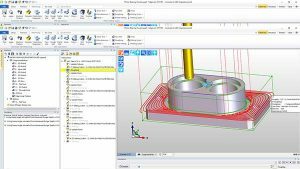 Machining information about the mould’s individual components means the milling and turning team can assign them to specific machines, and the files are opened in WorkNC for the tool paths to be programmed. Even though some parts are similar, all moulds manufactured by Dixence are different. Generally, the company makes two mould tools each week. 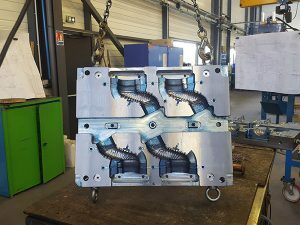 Dixence also produces one cold-runner block, which is positioned on the mould, meaning the company can multiply the number of injection points for rubber-based components. Dixence also uses WorkNC’s sister brand, WorkPLAN as its production control system. Beloeil says the company previously worked with an Access database and paper-based invoicing, “but with ever-increasing production levels we needed to avoid duplicating data processing”. With WorkPLAN, Dixence consolidates all information, such as sales orders, purchase orders, time management, delivery notes and invoices, which is relative to each project. A number of modules are particularly important to the company, including ‘Job Management’, which manages sales-related tasks and administration, from order confirmation through to delivery, allowing easy access to all project-related documents. In addition, the ‘Purchasing’ module includes the company’s forecast purchase budget based on the bills of material directly imported into WorkPLAN, along with supplier quotations. 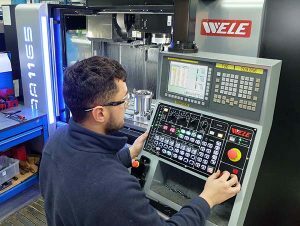 Subcontractor Alitech Precision, which specialises in supplying motorsport and automotive customers from its Silverstone facility, installed its first five-axis vertical machining centre in March 2017. This machine was the company’s fifth VMC, and was joined in December last year by another five-axis machine from a different source, the German manufacturer Hermle, which supplied a C400 through sole sales and service agent, Kingsbury. Most subcontractors progressing from three/four-axis machining to fully interpolative five-axis cycles gain significant benefits from adopting the technology. Apart from raising the complexity of freeform surfaces that can be profiled, key advantages are higher component accuracy and reduced cost of manufacture. 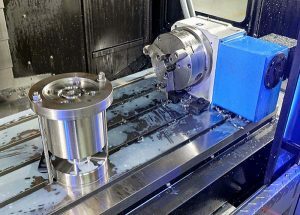 They are achieved by reducing the number of set-ups needed, as a part can be positioned automatically with the two rotary CNC axes before being milled and drilled using the three linear axes. The original five-axis machine, an entry-level model, delivered these advantages for owner and managing director Darren Cudd, who started Alitech in September 2014. He was delighted with the economical process routes he was able to establish, but there were two snags. One was a shortage of capacity, despite operating 24/5 and at weekends, as Alitech had been doubling turnover every year since its formation. Additionally, the company had progressed from producing mainly prototypes and limited batches of components to larger runs of typically 20-off complex parts, such as race car uprights, which meant that work was queueing for up to one month – an unacceptably long lead-time in this sector. The other difficulty was that Formula One teams were asking for the subcontractor to supply an increasing number of aluminium moulds for making carbon fibre components. The first five-axis machine struggled to hold a tolerance better than ±50 µm, so as much as five hours of manual finishing and polishing were needed on every mould to remove witness marks left by milling cutter step-overs. After the race season, the Hermle will be deployed on the five-axis machining of precision components within its 850 x 700 x 500 mm working volume. 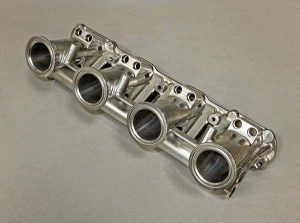 One such part already produced is an inlet manifold for a track car that was machined in two operations on the C400 rather than the eight previously needed on a three-axis VMC, which took far longer and required expensive fixtures for setting the component at different angles. 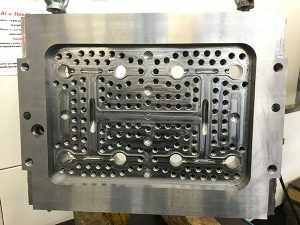 Another complex part cost-effectively manufactured on the latest five-axis machine was a billet dry sump that was designed and programmed in-house in SolidWorks and hyperMILL CAM software by head of CNC, Charlie Watts. He and Cudd had been researching the company’s next five-axis purchase for about a year before placing the order. They were looking for a large capacity and trunnion-type design, as they prefer the rigidity these machines offer over those employing a swivelling spindle head. Of the four options shortlisted, one was rejected due to its high price and insufficient X-axis travel, while another supplier provided questionable service. A third potential supplier, although offering an interesting horizontal-spindle solution, did not have a sufficiently large working envelope. The fact that another member of Alitech’s staff had used a Hermle machine while employed by a Formula One team, and praised its performance, coupled with a visit to the manufacturer’s open house in Germany last April, clinched the decision to buy the C400. The C400 forms part of the new ‘Performance Line’ range, which has the same fundamental attributes as Hermle’s high-end models, such as a mineral cast bed and stainless steel cladding throughout the working area. A 50-position magazine was included to increase the HSK-A63 tool capacity to 88, along with an 18,000 rpm spindle to maximise aluminium machining efficiency, as this material is almost exclusive processed in the Silverstone factory. 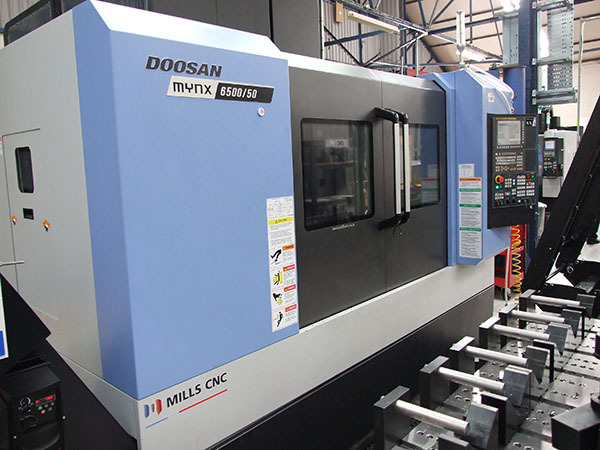 Mills CNC has recently supplied three Doosan machines to Mellish Engineering Services, a private, family-owned manufacturer of performance-critical, high-integrity and fully-traceable fasteners and hot-forged bolts used extensively, but not exclusively, in the oil and gas sector. 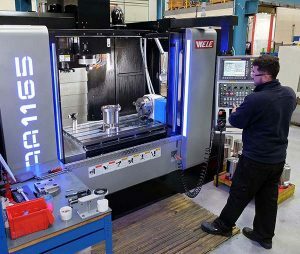 The machines, a Mynx 6500/50 large-capacity vertical machining centre, a Puma 2600SY Mk II multi-tasking lathe and a DNM 4000 vertical machining centre were installed at the company’s 26,000 square foot facility in Aldridge towards the end of 2018. Both standard and non-standard fastener components are being produced by the machines, including bolts, pins, clamps, studs, nuts and washers. 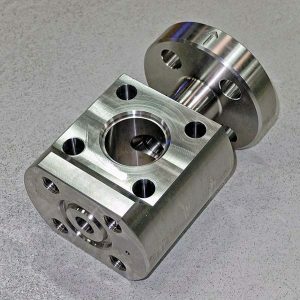 These parts are all made from hard and difficult-to-machine materials, such as Duplex and Super Duplex stainless steels, carbon steel, titanium, Inconel and Monel, and are machined to tight dimensional tolerances and high-quality surface finishes. They are machined in small batches right through to larger volumes to suit individual customer requirements. Mellish-manufactured fastener systems and solutions are in high demand. This demand has been fuelled, in no small part, by the company achieving API (American Petroleum Institute) certification back in 2017. As it would later transpire, 2014 proved to be a ‘watershed’ year for Mellish because, instead of battening down the hatches, cutting overheads and riding out the downturn, the company made the strategic decision to plan ahead and invest in its future. In 2017 Mellish achieved its ambitions, gaining API Q1, API 20E and API 20F certification. Mellish is one of only a handful of companies across Europe to have achieved these standards and, as a consequence, is able to use the official API monogram on its machined products. Since 2017, Mellish has experienced a marked increase in the number of companies making contact, enquiring about the company’s solutions and, ultimately, placing orders. To meet the growing demand for its fastener systems and solutions, Mellish, as part of its company-wide continuous improvement programme, makes regular investment in its people, plant, equipment, processes and systems. The recent acquisition of the three Doosan machines is a case in point and is evidence of Mellish’s continuous improvement programme in action. The Mynx 6500/50 is a rigid, large-capacity, box guideway vertical machining centre with a large working envelope (1270 x 670 x 625 mm), a large work table (1400 x 670 mm) and a high torque BT50 spindle (15 kW/6000 rpm). Doosan’s Mynx 6500/50 was purchased following the completion of a successful cutting trial undertaken at Mills CNC’s Technology Campus facility. 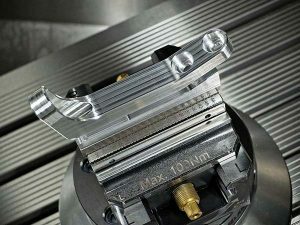 The trial was intended to demonstrate the Mynx 6500/50’s cutting capabilities and its ability to reduce part cycle times when machining titanium tie-rod components. 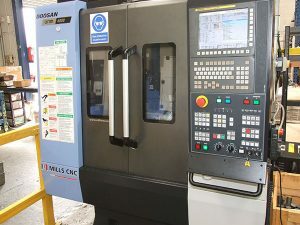 Since being installed, Mellish has its focused efforts on refining and optimising the machining process, and has invested in a state-of-the-art manual twin-pallet change system that is positioned in front of the machine, enabling virtually continuous production with minimal operator intervention. The 10” chuck/76 mm bar diameter Puma 2600SY Mk II is a multi-tasking lathe with a Y axis, sub-spindle and driven tools. 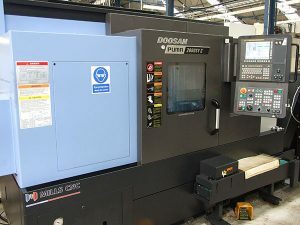 Doosan’s Puma 2600SY MK II, with its integrated mill-drill capabilities, enables Mellish to machine small turned parts, like studs and nuts, to completion, in a single set-up. The machine was supplied with a bar feeder to ensure continuous production. The DNM 4000 is a fast (48 m/min rapids) vertical machining centre equipped with a direct-drive spindle (18.5 kW/12,000 rpm) and a 20-position ATC. This machine was supplied with a fourth-axis unit to increase its flexibility and productivity potential. The DNM 4000 is being used to machine a family of small fastener parts. Productivity and operational efficiency are critical to Mellish’s future growth and prosperity. The investment in Doosan machine tools from Mills CNC, combined with the company’s determination to “sweat its assets” and continuously look at ways to optimise its machining processes, means that Mellish is able to meet the surge in demand for its fastener products and solutions. 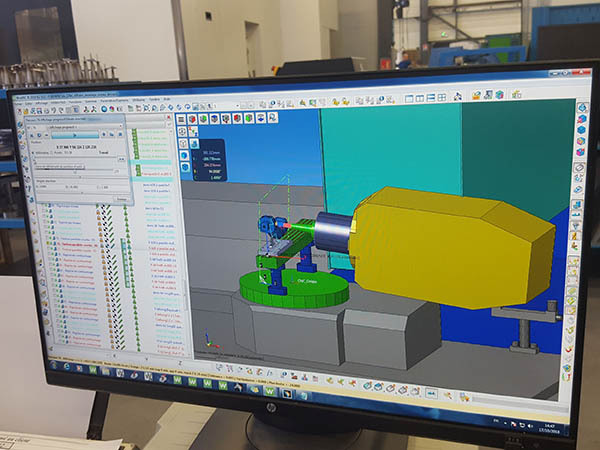 An engineering subcontractor recently moved all of its CAM programming to Edgecam after Seco Tooling provided the company with support solutions to specific issues on complex components. I&G Precision Engineering had used Edgecam to drive an Emco lathe operated by the firm’s hands-on managing director Andrew Evans since investing in CNC machinery in 1992. However, as the company expanded with further machine tools and more shop-floor staff, other CAM packages were introduced. “Originally, we used Edgecam for both milling and turning on those new machines, but when I came off the tools we decided to try other systems, and it was eventually only used on the lathe,” he says. Operating out of 11,000 sq ft premises in Ystalyfera, Swansea, with 11 employees, the company largely manufactures parts from stainless and tool steels, as well as aluminium, for aerospace, food, beverage, medical and defence customers, along with the Royal Mint. I&G makes a number of components for aerospace ground-support systems such as jigs and fixtures that are used to remove engines and wing parts. The company also produces everything from bakery equipment, including rollers for production machines and castings for dough-rollers, through to electronics housings for defence customers. In addition, the company has received commendations from the NHS for its work in devising breathing apparatus that help new-born babies inhale xenon gas as part of medical treatment. Andrew’s son, Mike, who is engineering director and workshop manager, says that I&G works closely with Seco Tools, which recently provided the firm with tooling and programming support to improve the production process on a specific job. All new components now go through Edgecam, and production runs of older parts are all being reprogrammed. 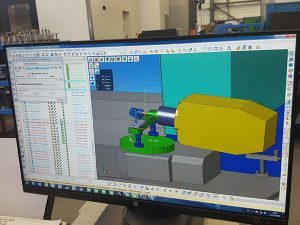 Evans says that the software’s milling and turning modules ensure they can ship between 600 and 700 components each month, normally on a three to four week lead time. 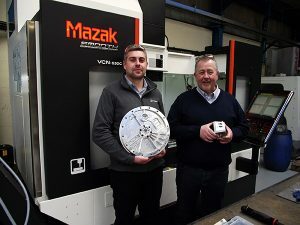 He describes Edgecam’s ‘Waveform Roughing’ capability as “massive” for the company’s growth plans, in terms of driving down cycle times and increasing capacity, enabling I&G to take on additional work. “We do a lot of 3D milling on features such as pockets, and we previously undertook the roughing cycles in the traditional way, often just stepping down 1 mm at a time. However, Edgecam allows us to step down up to 10 or 15 mm at a time. Then, as we pocket out to those depths, we can profile back and come out of the pockets, so it saves considerable time. He cites a project where Waveform slashed the roughing cycle from 30 to 10 minutes, and helped reduce the overall machining time by half. The company is planning more investment in the coming 12 months, including the purchase of Edgecam Inspect, which creates measurement cycles on machine tools. “This means we’ll be able to inspect every part on the machine if necessary, after each operation, and provide a customer report,” says Evans. 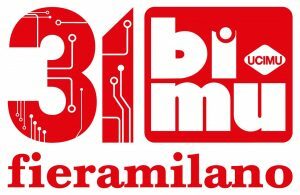 I&G is also considering a five-axis machine, and possibly a CMM from Hexagon. Concluding, Evans says he introduces Edgecam to the company’s apprentices immediately.